As the first Italian town across the border, Ventimiglia offers you a quick taste of Italy on your visit to the Cote d'Azur. It's amazing how the ambience can change in just a few short kilometers from France! There's a long stretch of rocky beach and a hilly old town but the main draw for travellers is the Ventimiglia Friday market. Stall after stall fill the streets of the "new town" east of the river, selling clothes, leather goods, jewelry, household items and more. Don't be afraid to bargain and you're sure to find some good deals. One word of caution though. For too long the Ventimiglia market has been selling fake designer goods such as "Louis Vuitton" bags, "Rolexes", "Hermes" accessories. 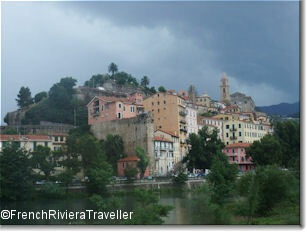 French customs officials are wise to the ways of Ventimiglia now and frequently conduct spot checks of travellers coming back from Ventimiglia by train or car. The fines for possessing designer fakes are astoundingly high and officials are unforgiving. Ventimiglia can be shoulder-to-shoulder with shoppers on Friday, especially in July and August. Prices are higher too. If it's the Italian experience you're after, come during the week, have a gelato, and peruse the regular stores which are still cheaper than France. Ventimiglia's Food Market (open mornings from Tuesday to Saturday) offers a colorful panoply of Italian products and succulent produce. On Friday, I highly recommend taking the train as parking is nearly non-existent. Trains from Nice run hourly at least and the trip takes less than an hour. The train station is right in the centre of town which is convenient. Take your car if you must and go via the A8 motorway.